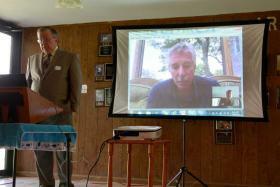 David Lincoln, environmental geologist with Sierra Club, hosts a video conference with lawyer Jan Schlichtman at the Faulkner County Citizens Advisory Group town hall meeting May 29. Schlichtman spoke about Qualified Settlement Funds. Sixty days after the ExxonMobil Pegasus Pipeline broke, spilling barrels of Wabasca crude oil into the Mayflower community, the Faulkner County Citizens Advisory Group held a town hall meeting to discuss the spill and the impact it has had on the community. The meeting, held May 29, hosted several discussions about health, legal action and wildlife concerns. David Lincoln, environmental geologist with Sierra Club, suggested the people of Mayflower look into a Qualified Settlement Fund. “It’s a trust that the IRS says can be created to distribute funds for settlement and it is a trust that is run entirely by the community,” Lincoln said. Qualified Settlement Funds have been used in other instances, including in Danversport, Mass., where a paint factory exploded after the steam heater was left on over the Thanksgiving holiday in 2006. Lawyer Jan Schlichtman helped the Danversport community with their Qualified Settlement Fund, and Schlichtman video conferenced with the Mayflower town hall meeting Wednesday, answering questions and explaining more about the special trusts he has helped set up for victims of several disasters. The Qualified Settlement Fund creates a unique relationship between a lawyer and his or her clients, Schlichtman said, avoiding conflict between clients.